When the Stephen A. Schwarzman Building opened in 1911, it had a state-of-the-art elevator and pneumatic tube system which carried books from the seven underground floors of bookshelves to the readers in the above-ground reading rooms. That system was replaced in 1991 with a conveyor system during a renovation and expansion, and now it is being supplanted again by a new book train installation. 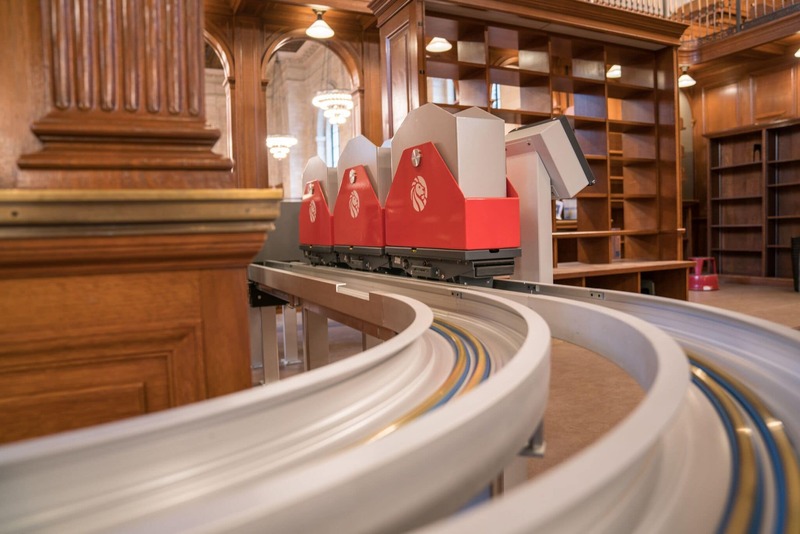 Boing Boing, Lauphing Squid, DNA Info, and other sites report that the New York Public Library has completed the installation of a book train system consisting of 24 individual cars, each of which is capable of carrying 30 pounds. You can see the book train in operation in a video at the end of this post. Moves 75 feet per minute. Moves materials through 11 levels of the library, totaling 375 feet. Takes approximately five minutes to go from the Milstein Stacks to the Rose Main Reading Room (it takes longer for requested materials to be delivered, as the request needs to be received, the materials pulled by staff, and then placed on the system). I grew up on the campus of the University of Kansas (my mother was a student), and frequented the Watson Library. I don't know how it was equipped when it opened in 1924, but when I saw it in the 1980s (just after it was remodeled) I can't recall that it had any type of automated delivery system. Instead it had stacks which college students could access and get the books themselves. Libraries used standard library carts to reshelve titles, and accessed the nine floors of stacks via elevators. That is probably for the best; if the library had had a conveyor system then the college students would have tried to ride it, and broken it. Nice. But I still prefer the trains in Dr Seuss. (And I see that the Cat in the Hat is running for President).